Evidences about ethnicity of the creators of Corded Ware Culture, which was developed out of Old Pit culture, are given apart (see the section "Ethnicity of the Neolithic and Chalcolithic cultures of Eastern Europe"). Archaeological data evidence that at the beginning of III mill. BC similar cultures appear in Central Europe having such characteristic features as Corded Ware and battle-axes. At least, their appearance in Małopolska (Cracow and Sandomierz and other groups) can be dated by Radiocarbon method since 2900/2800 years. BC [WŁODARCZAK PIOTR, 2001: 106]. 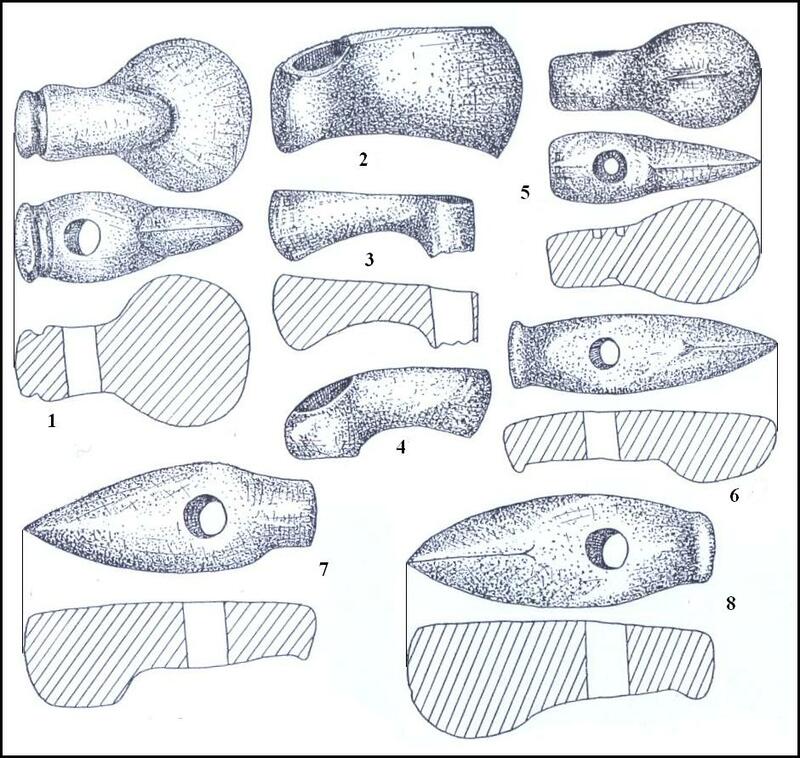 Left: Battle-axes as one main feature of Corded Ware culture. Stone and copper axes found accidentally in Fore-Carpathia and Podolia. 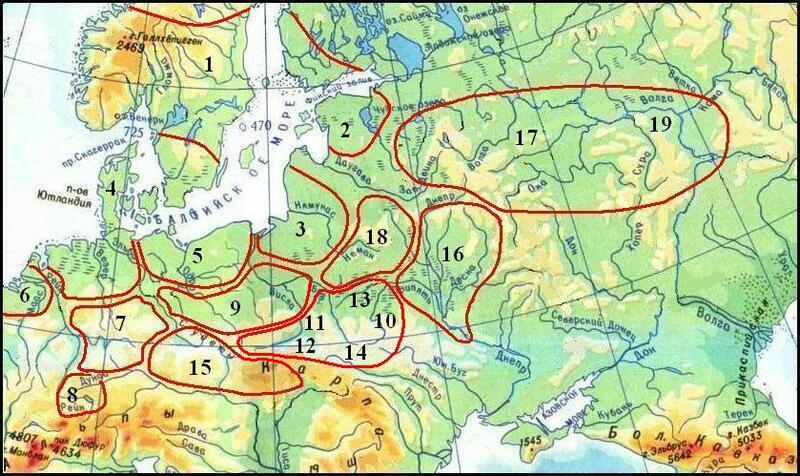 The complex of the Corded Ware culture, some of which have such names as Fatyanovo, Balanovo, Beaker culture, Single Grave culture, Battle-axe culture etc was spread on the space from the Volga River to the Rhine, from southern Sweden to the foothills of the Alps and Carpathians. 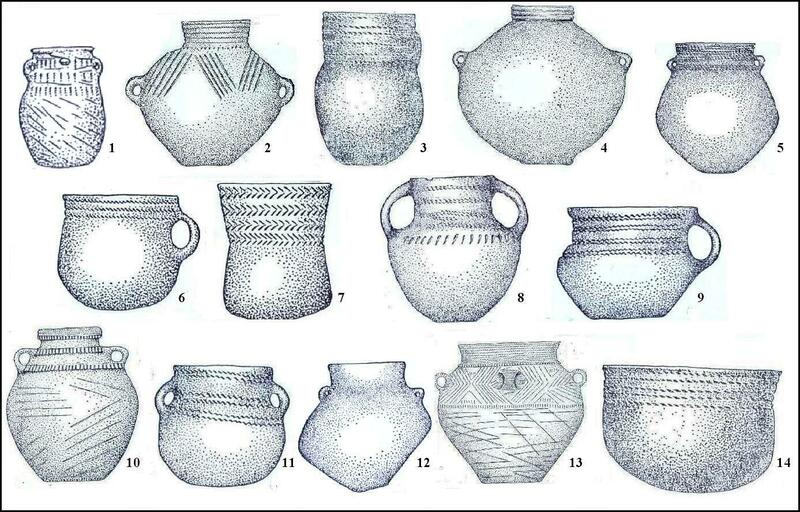 Left: Some types of Corded pottery from Ukrainian sites. Settling quickly over a large area, Türks influenced the culture of the local population, giving rise to new cultural traditions. Inverse influences were very minor. For example, the aliens have borrowed from Trypillians symbol "Tree of Life". However Türks brought with themselves the image of the Bull and the Phallic saints as a symbol of male power and, as a consequence, patriarchal clan system, as well as ancestor worship and funeral rite. (ALEKSEYEVA I.L. 1991: 20-21). Most clearly these effects can be observed in the archaeology of the Right-bank Ukraine, especially in th Usatove group near the city of Odessa. Although they have been associated with the cultures of the Balkan-Danubian tradition, "but one of the most important and characteristic features that make separate this group – funeral rites – certainly linked to Old Pit culture tradition" (MASSON V.M., MERPERT N.Ya., 1982: 329). In addition, Trypillian clay-ware with sand and pounded shells, a feature that distinguishes Seredniy Stih and Pit cultures, occurs on the banks of the Southern Bug and Ingulets Rivers [ibid., 211]. Human skeleton buried in the back with knees bent, ie in a pose typical of carriers so-called "Kurgan" cultures, which was found near the village of Nezvisko of Ivano-Frankivsk region, may indicate further advancing Türks westward. At the same time, the anthropological study of archaeological sites of the North-Western Black Sea Region suggests about the process of cross-breeding and mutual assimilation of Trypillian population and arrived here tribes of Pit culture [ALEKSEYEVA I.L. 1978: 56]. 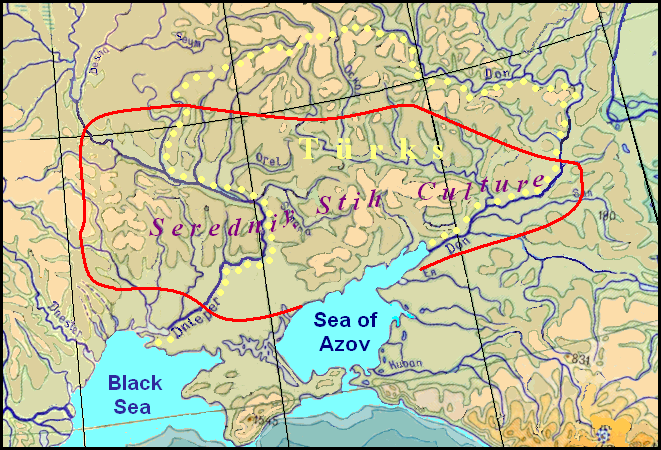 At right: The original territory of the Turks in the area between the Dnieper and Don Rivers (indicated by yellow dots) and distribution area of Seredniy Stih culture (limited by the red line). The territory populated by the Turkic and the territory of Seredniy Stih culture, which was developed from Pit culture, are basically the same. However, the spread Seredniy Stih culture on a sufficiently large area of the Right-Bank Ukraine may indicate that the resettlement of the Turks beyond the Dnieper occurred much earlier than they started a mass movement in a wide area of Europe. For a while they were peacefully coexisting with Trypillians. Trypillian population was very numerous. This is evidenced not only by large number of settlements of Trypillian culture, but also their size. Study of British scientists and their Ukrainian colleagues by using geomagnetic method allows to estimate the number of individual Trypillian settlements in the amount of from five to twenty-five thousand people (RASSMANN KNUT. 2014). There are in Ukraine nearly a thousand Trypillian sites. This means that the total number of the population of Trypillian culture could be several million people. However, it was considered much earlier that the Trypillins numbered about 400 thousand, which is also very much for that time. Even such a mass of people could not disappear without a trace, but the calculations of archaeologists show that the number of Trypillians, which survived the invasion of nomads, was reduced three to four times (VIDEIKO MYKHAILO. 2011: 379). So we need to assume that the Trypillians were involved in massive migration process of Türkic tribes. This is evidenced by the typical Trypillian painted dishes, which can be found in the complexes of the Corded Ware culture (PETROV V. 1947: 35). The Türks themselves as nomads were in a much smaller number and could not settle on the vast expanse of Europe, where they left traces of their Corded Ware culture (hereinafter CWC). However, due to inherent for nomads militancy and better organization they subordinated Trypillians their cultural influence, impose the way of life and, obviously, the language, as it is evidenced by numerous place names of Türkic origin in Central and Northern Europe. Of course, numerous Trypillian people, in some cases, where their settlements numbered several thousand inhabitants, could offer serious resistance to the invasion and avoid complete enslavement. An analysis of the archaeological finds of the time confirms this assumption and there is reason to believe that the Trypillian culture continued to exist for quite a long time, undergoing various transformation processes (VIDEIKO MYKHAILO. 2011: 375-380). At left: Concentrations of the CWC sites in southeastern Poland, western Ukraine and eastern Slovakia (By J. Machnik with modifications). a – solitary kurgans and their clusters, b – burial grounds and their clusters. J. Machnik noted by roman numerals the three stages of development of culture CWC in Poland. The map is taken from the publication The absolute chronology of the Corded Ware culture in the south-eastern Poland of Piotr Włodarczak and toned by the author with color. 10. 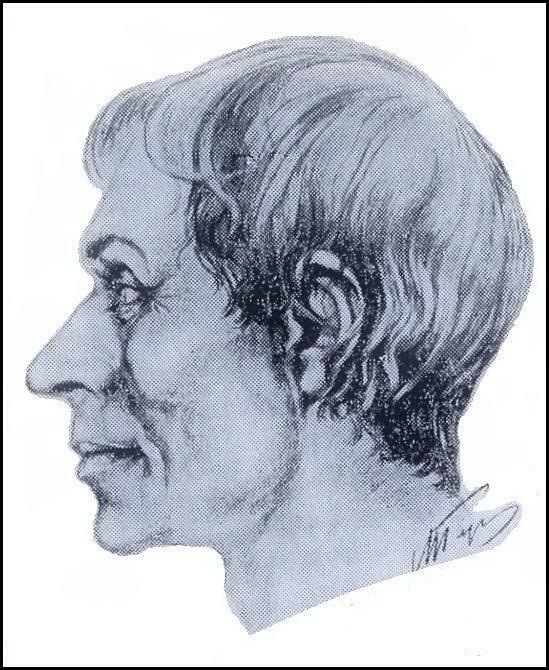 Common (proto-European) anthropological features (SVESHNIKOV S.K. 1974: 170). Trypilla culture developed mainly based on agriculture, which has lost its effectiveness due to the depletion of the soil without the use of fertilizers and crop rotation. At the time, nomadic livestock give more surplus product, as it could make better use of steppe resources. As a result mutual assimilation and Trypillians and Pit people was accompanied with the transition to nomadic cattle-breading. However, due population growth and the beginning of using more advanced methods of cultivation, reverse transition to agriculture became inevitable. Approximately after five centuries people in the basin of the middle and upper Dniester River has carried a sedentary life. Archaeological sites of Komariv culture, common for space from the Southern Bug River to Volyn, testify to sedentary life with agriculture and livestock-based economy of the carriers of this culture. The map was compiled on the basis of Zalizniak's scheme [ZALIZNIAK L.L. (Ed.) 2005. 165. Рис. 19]. When covering the topic of Türkic expansion we will rely heavily on the Bulgarian toponymy, the vast majority of which can be interpreted by the Chuvash language, what suggests that the Bulgarian ethnic element was prevalent among CWC. These place names are mapped in the system Google Map, which is convenient ability to easily make changes and additions, which need for will inevitably arise in future studies. The map is supplied below. The total number of place names of the prospective Bulgarian origin in Europe is equal more than nine hundred, but about three hundred of them belong to the Scythian time. They are common in Central and Eastern Ukraine, Romania, and Hungary and they are only partially shown on the map above. This topic is discussed separately. Here we will consider toponyms correlated with the CWC sites, which location was plotted on the map according to disparate sources. In particular, data on the sites of Fatyanovo culture in the basin of the Moscow River were taken from the work of one of the Russian archaeologists (KRENKE N.A. 2014). A chain of Bulgarish place names follows the banks of the Desna, the Seym, and the Oka Rivers approximately from Kiev to Moscow but we have no exact information on CWC sites along this path, although Ukrainian archaeologists prove that the creators of the Fatyanovo culture moved to the Volga basin from the banks of the Desna where Middle-Dnieper version of CWC was spread. Obviously, the Bulgars, having settled the Right-Bank Ukraine and increased their numbers by assimilating the Trypillians, continued their expansion not only to the west, but also to the north. The Baltic-Finnish languages have words with the meaning "hill, summit, height" (Fin. kukkula, Est. kukal and other), and in the Carpathians there is a peak Kukal. For the explanation of these names is well suited Chuv. kukăl' "pie". It is not known what form of pies were baked by the ancient Bulgars, but the semantic correspondence of the Baltic-Finnish words and the name of the mountain in the Carpathians indicate a common source of borrowing. In the Chuvash language there is a word măkăl' as a common name for various kinds of bulges on the body. They have matches in Khant. möγǝl, Mansi mygyl, Hung. mell "bossom". Fin. mukula and Est mugul "tuber" have the same origin. Veps. parz' "log" corresponds Chuv. părăs "beam". Similar words in a similar sense are present in other Baltic-Finnish languages. Other Chuvash-Finnish lexical correspondences should be found. One could assume that not Bulgars but other Turkic tribes were the creators of the Fatyanovo culture, but the attempt to decipher clearly non-Slavic names on the area of this culture by means of the Tatar, Turkish, and other Turkic languages ​​had no success. On the contrary, the creators of the Balanovo culture were obviously other groups of Turks who moved from the lower Don upwards along the Volga. Ethnicity of the Volga toponymy was not considered, because its stratification is impossible, in view of the constant presence of Turkic people in the Volga region which are correlated with the Volga Tatars. Soltanovo, an agro-town in Rechitsa district of Homel Region – Chuv saltăn "to uncoil". Madora, a village in Rohachev district of Homel Region – Chuvash pagan names Mattur, Matur, Tat. matur "nice, beautiful". Dashkiwka, an agro-town in Mohylev district and Region – Chuv tăshka "to mix". Staryia (Old) Chamadany, a village in Shklow district Mohylev Region – Chuv chama "size, measure", tan "equal". Orsha, a town in Vitebsk Region – Chuv ărsha "haze, a sultry haze". Reliability of the picture of Turkic expansion bringing CWC to Central and Northern Europe depends on credibility of the interpretation of European toponymy by means of the Chuvash language. As always, random coincidences of names with Chuvash words can happen, therefore the likelihood of interpretation of local toponymy can be higher when the names are associated with local conditions and also consist of logically interconnected words. This topic is discussed in more detail in the section "Proto-Bulgarish Place Names in Central and Northern Europe"
For example, the name of the second largest city in Estonia, Tartu is quite convincingly decrypted using the Chuvash language. Chuv. tără "summit" and semantically related tu "a mountain" correspond the terrain, as the city has a mountain Toomemägi. When the number of such cases is fairly high, in general the probability of the plausibility of the whole set of transcripts increases, despite some non-systematic errors. Some examples of other situational motivations for names are discussed below. Sometimes such place names occur when their components are in close semantic and logical connection and in addition correspond to the terrain that the random coincidences seems incredible. There are in Germany, France, Switzerland, Austria more than a dozen settlements with the name Aspach. When we divide the word into two components and translate them as Chuvash words, we will see how they fit together – Chuv. ash "to puddle mud, wade sinking (in mud, snow)" and păhh "puddle, feces, muck". These settlements are located in an area that was once muddy. Two villages with strange names for the Poles Shury and Shurypily are located among the Masurian marshes. Taking into account Chuv shur "swamp", the search for decrypt the second word is going to be successful. If Chuv. pile "buzz" (about mosquitoes) add to Chuv. shura, the name can be understood as "mosquito swamp". Buzzing mosquito clouds over the marsh gave a good reason for such name. This conjecture is confirmed by a similar interpretation of the ancient name of Tallinn Kolivan using Chuv. külĕ "lake" and văn, imitating the hum of insects. Lake Ülemiste is very close to Tallinn, and it is an additional argument in favor of this interpretation. The name of the German city of Nuremberg is well explained by Chuv. nür "humid, wet" and en "side", and this explanation is confirmed by preserved alluvial sediments of floods of Pegnitz River in the northern and north-eastern part of the city. Interpretation of another German town Baruth, in Brandenburg in locality Fläming, rich on massive chalk sediments is perfect by Chuv. pur "chalk", ută "valley". 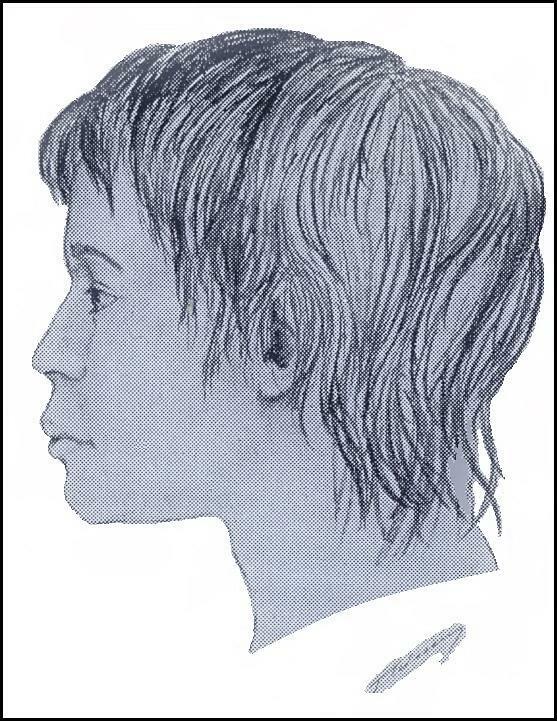 Left: The portrait of a buried boy 14-14 years old on the settlement Zoziv I. Reconstruction after the skull was made by G.V. Lebedynski (SVESHNIKOV I.K. 1974, Fig. 33). Nomadic Türks had no permanent place of residence, their stationary settlement appeared after changing economy to mixed form of animal husbandry and crop farming. Corded Ware culture, certainly was created by nomads, so the names of settlements attributed to the Bulgar refer to later time when the Türks have settled down. Although the space of their settlements could remain the same. Comparing the location on the map Bulgarish place names and CWC sites, as well as taking into account the fact that the Türks originally inhabited the steppe zone, we can trace the direction of their migration. The largest cluster of Bulgarish place names is observed in western Ukraine. The eastern boundary of the cluster, if you do not take into account settlement of Chornolis culture, extends approximately along the Zbruch River. No sites of CWC were detected to east of it too. In principle, the nomadic Türks had to occupy almost treeless Podilla fully, but they moved further westward in the forest zone of the Upper Dniester, which begins beyond the Hnyla Lypa River. Here operated the same reason as in the movement to the north – the area was fairly densely populated by farmers of Trypilla culture which sites here were been found in number more as 300. It was simply impossible for Nomads to find pasture for livestock of required size. Beyond the Zbruch River on the left bank of the Dniester River density of Trytillian population decreases gradually, and the Türks begin settling here. Trypillians settlements interspersed with Türkic ones, become rarer, although on the right bank of the Dniester River they still drawn by the thick band to the mouth of the Hnyla Lypa River, and then disappear almost completely. Judging by the numerous toponymy, the majority of the Bulgars stopped in these places for a long time, but gradually settled into neighboring lands. Another their part in two separate groups moved westward along the Carpathian Mountains and north bypassing settlements of Indo-Europeans. Separated from the main bulk, some part migrants passing through the Moravian Gate, settled in Moravia and Bohemia, where they got into Bavaria. Turkic-Slavic Language Connections are considered separately. Here, for more convincing, we will consider examples of place names in Germany, interpreted by means of the Chuvash language. Baar, a municipality in Aichach-Friedberg district, in Bavaria – Chuv. păhăr "copper"
Basel, a city in Switzerland – Chuv păsăl "to spoil, deteriorate"
Böhl-Iggelheim, a municipality in the Rhein-Pfalz-Kreis, in Rhineland-Palatinate -Chuv ikkĕle "to double", ikkĕllĕ "duality". Cham, the capital of the district of Cham in the Upper Palatinate in Bavaria – Chuv khum "wave". Hanower, the capital of the federal state of Lower Saxony – Chuv khăna "guest", vere "custom, usage". Homburg am Main, integral part of the community Triefenstein in Main-Spessart district (Bavaria) – Chuv. khum "wave". Kandel, a town in the district of Germersheim, in Rhineland-Palatinate and a mountain of the Black Forest – Chuv kăn "potash", tĕl "place, country". Potash was received from wood in the Black Forest long since. Kiel, the capital of northern German state of Schleswig-Holstein – Chuv kil "house, family, yard". Kirkel, a municipality in the Saarpfalz district, in Saarland – Tschuv khyr "pine-tree", kĕl "ach". Kyritz, a town in the Ostprignitz-Ruppin district, in Brandenburg – Chuv kĕr "Herbst", eç "work". Nürnberg (at first Nuremberg), a city in the state of Bavaria – Chuv nür "moist, humid", en "site, land". Perkam, a municipality in the district of Straubing-Bogen in Bavaria – Chuv pĕr "lonely, single, whole, alike", kăm "ash". Zorge, a municipality in the district of Osterode, in Lower Saxony, Germany – com Türk. jorğa/jurğa "pacer", "amble" (Chuv çărkha). Toponymy not only attests ethnicity of the creators of CWC, but can also give some idea of the character of colonization of new lands by Bulgars, economic activity, material and spiritual culture. For example, among all Bulgarish place names are the most common, namely more as 20 times, having stem tekl. There are in Ukraine six villages of Teklivka, and two more villages of Teklino, Teklino, Tekla, Teklanovka, in Poland – the villages of Teklinów and Teklin, in Hungary – Tekla, Thekla utca, Teklafalu, in Germany existed Tecklenburg county. Anything suitable to decrypt these names are not found except Chuv. tĕk, which among others means "quietly, still". With the addition to this word common Chuvash suffix -lĕ, the adjective "calm, quiet, meek" is formed and it was used for the names of settlements. Approximately the same meaning is given to the names of Shablykino (Chuv shăplăkh "silence, calm"). The abundance of names with this meaning suggests that people have chosen secluded places for settlements, protected not only from winds, but also from possible attacks of hostile tribes. It turns out that despite the militancy inherent in nomads, they valued peace and quiet in life. Also many names are found coming from Сhuv. pulăkh "fertility". Only in Bavaria there are eight settlements called Pullach. In Ukraine there is the town of Bolekhiv and two villages of Bulakhivka, in Poland there are three villages of Bolechowice and villages of Bolechowo and Bolechów, in Russia – the cities of Bolekhovo and Bolkhov, the villages of Bulakhi in Ukraine and Belarus, the town of Bulach in Switzerland. Fertile lands were preferable for both farmers and pastoralists. The fact that agriculture played an important role in the economy of the ancient Türks is confirmed by the names of the Russian villages Akulovo, Okulovo, Akulino and others of the same root. Explanation of these names, which number is more than sixty, is fairly easy by Chuv aka "arable land, plowing" with the affix -a, forming adjectives with a similar value from the nominal stem. 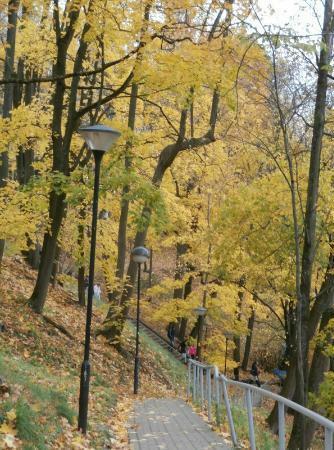 The names of Cherkassy, ​​Cherkasy, Charkasy, which can be deciphered as "autumn settlement" (Chuv. kĕr "autumn, of autumn" and kassy "village, street, settlement") are common in Russia, Ukraine, Belarus and Poland. They say about the peculiarities of nomadic cattle breeding. This interpretation corresponds to the widespread Turkic qyshlaq, which is translated as "wintering" (from the qysh "winter" of the same origin as the Chuv. kĕr). In the summer the Turks as pastoralists graze cattle nomadically and with autumn coming stayed in one place where hay was stored by them in advance for the winter. The level of development of social relations is expressed by names derived from a word similar to Chuv. payăr "own", such as Boyarka and Boyary, or Bavaria (German Bayern). The names of Baar in Switzerland and Bacharach in Germany are associated with the mining or processing of copper (Chuv păkhăr "copper"). The name of the Swedish town of Sösdala speaks of the weaving craft (Chuv süs "hemp, fiber" and tala "homespun cloth"), and the name of the Ukrainian village of Gavarechchin does about pottery (Chuv kăvar "burning coals, embers", ěççyni "worker"). Numerous names of Yam and Yampol speak about practising tar production (Chuv yam "tar distillation"), and names such as Kandaurovo, Kandel, Kantelina do about the production of potash (Chuv kan "potash").